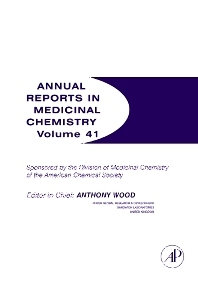 Annual Reports in Medicinal Chemistry provides timely and critical reviews of important topics in medicinal chemistry together with an emphasis on emerging topics in the biological sciences, which are expected to provide the basis for entirely new future therapies. Sections I-IV are disease orientated and generally report on specific medicinal agents. Sections V and VI continue to emphasize important topics in medicinal chemistry, biology, and drug design. Section VII looks at Trends and Perspectives in the pharmaceuticals market.